In our last blog post, we talked about stair nosing and why your cinema needs it. Stair nosing is the finishing piece applied to the forward edge of stairs, step-downs, and landings, creating a rounded quality finish. Today, we will talk more about stair nosing and cinema safety. There are many different kinds of stair nosing available to the cinema operator, allowing you to really customize the look and feel of your cinema hall. What was once a passive safety feature can now enhance the whole customer experience at your cinema. 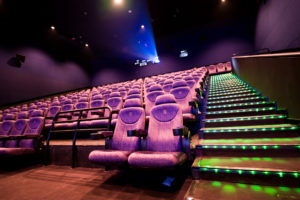 For example, the use of non-slip inserts in the stair nosing can be customized to enhance the appearance of the cinema. Non-slip inserts are likely required to ensure you comply with your local safety laws, but their appearance does not need to detract from the ambiance of the environment. Stair nosing can also incorporate glow in the dark materials, ensuring they are visible even when the power is out. The control of the stair nosing can be linked to the broader theatre management system, allowing automated or remote control of the appearance of the lighting. Of course, there are laws that you must conform to when choosing stair nosing. You must meet local building safety codes – failure to comply could result in hefty fines and even closure of the venue until the stair nosing is changed. And if a patron becomes injured, there could be a protracted and costly legal process, as well as a loss of reputation. If you have any questions about what the local building code is, the best thing to do is ask either the company providing the stair nosing or your contractor. Using cinema LED lighting Reduce Utility Costs →← What is Stair Nosing and why does your Cinema need it?